Begin this loop at exit 59 on Hwy. 278. Stop at Bannack then return to the highway. Continue west across the Big Hole Divide to Jackson. 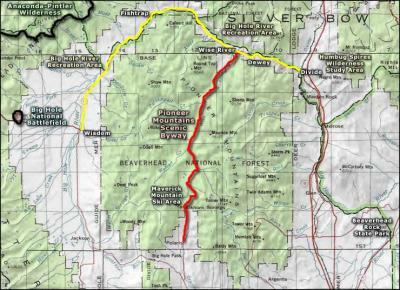 The stretch from Jackson to Wisdom parallels the Big Hole River, one of the top blue-ribbon trout streams in America. This stretch is one of the last areas where rare arctic grayling trout survive. Lewis and Clark first named this fish as a “silvery trout” in 1806. Continue to Wisdom through the “Valley of 10,000 Haystacks.” Follow Hwy. 43 east to Wise River. 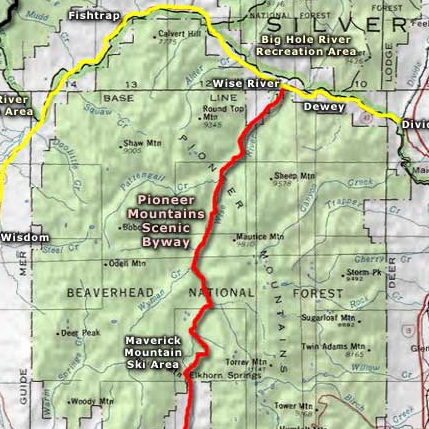 At Wise River pick up the Pioneer Mountains National Scenic Byway and head south. Follow this highway, stopping often to enjoy the scenery, through Polaris and the Grasshopper Valley. Along with this highway, you travel the length of the Pioneer Mountain Range. To the west, you will see gentle forested terrain while the east reveals dramatic granite peaks reaching 10,000 feet in elevation. Along the way are lodgepole pine forests, mountain meadows, and broad willow bottoms. The road winds its way up a gentle ascent to a 7,800-foot divide. If you wish to stretch your legs and lace up your hiking boots, there are numerous trailheads along the Byway leading into the Pioneer Mountains. If you have the time, you may want to stop and soak in the hot pools at Elkhorn Hot Springs. Connect with Highway 278 to complete the loop.